In March of 2017, the Monaghan IFA appointed Galway native Frank Brady as its chairman at the association’s annual general meeting. Irish Tractor & Agri caught up with the man himself recently to hear about his successful pig farm and how he has found the first 16 months of his role with the Monaghan IFA. Based just outside Tullyvin, Co Cavan, Corrick Bridge Pig Farms Ltd has been up and running 22 years now and for Frank Brady the plan is to keep his medium-sized farm thriving, as he continues to juggle his numerous roles. Frank is originally from the small town of Glenamaddy in Co Galway and moved to Latton in Co Monaghan, before purchasing his own pig farm in 1996 and eventually building it into the success it is today. A devoted GAA man, his profile didn’t take long to rise within the local region after having managed several club senior sides in both Cavan and Monaghan and then going on to steer the latter’s county minor football team to a first Ulster championship triumph in 68 years in 2013. Along with his deep involvement in Gaelic Games throughout his life, Frank has also been immersed in pig farming most of his working life and his passion for it remains as resolute as it has ever been. Last year he was elected as the Irish Farmers’ Association’s chairman for Monaghan at their AGM in Castleblayney, succeeding Brian Treanor (who was elected vice chairman on the same night) in the role. The county chair is seen as the key IFA leader in that particular county, representing farmers in their county on IFA’s governing body – the National Council. Frank took some time from his increasingly busy schedule to fill in Irish Tractor & Agri, as he comes up on the first year-and-a-half of his chairmanship. “I’m quite enjoying it since been elected at the AGM that night and I feel I’ve grown into it since then,” he explained. Frank has never been a man to shy away from his roots and those roots were dug deep in Glenamaddy prior to making the decision to settle in the Farney County. He’s very much a Galway man through and through and was one of many Tribesmen (and women) in Croke Park last September when Micheál Donoghue’s team ended their county’s agonising 29-year wait for the Liam MacCarthy Cup to come back west of the river Shannon. These past two decades however, have seen him very much in Monaghan’s corner on many occasions as well, and he can even be spotted on social media wearing the white and blue Farney colours! It all started with a move north east to purchase a farm, as he explained. “I’m originally from Glenamaddy and went to college in Athenry,” Frank outlined. “After a while, it ended up that I was in the position to purchase my own farm in 1996 and I did so with a man called Martin Lynch. 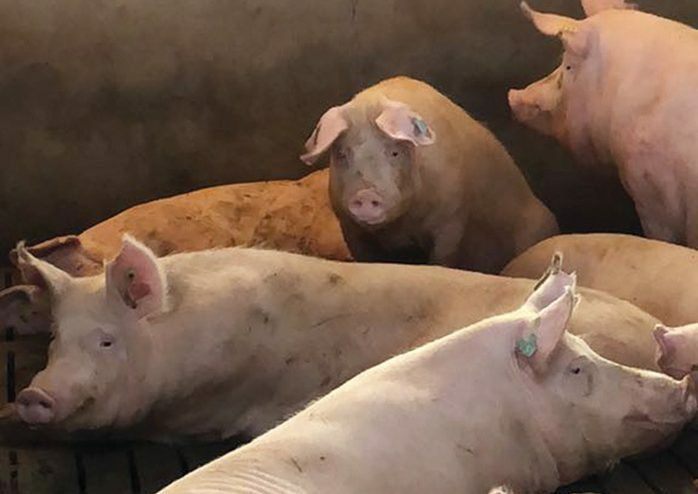 Corrick Bridge Pig Farm more or less grew year on year and now its owner finds himself in a role that he perhaps never could have envisioned himself in when he first set out in this line of work. After his election in March of last year, he immediately earmarked the involvement of the younger generation in the Irish Farmers’ Association as an objective, stating that “we have to start drawing young people in and give them something that they’d be looking forward to”. As for the issues that are facing the agricultural industry nationwide, Monaghan’s IFA chairman is well aware that they are plentiful. He recently spoke out on the use of Irish shamrocks on food products which have only been partially processed in this country. His feeling is that shoppers are being “duped” into buying what they believe to be an Irish product and feels that labelling on foods should give a clear indication as to where the product being bought by the customer was produced. It won’t be the last on this issue you hear of from Frank Brady, that you can be sure of. As for heat wave of late June/early July which also effected farmers nationwide, he pointed out that vegetable farmers were being “hit the hardest” of all the areas within the agri-industry by the drought. The IFA itself called on retailers, facilitators and the foodservice sector to support vegetable growers as their recent struggles with rising input costs and labour issues have been compiled by the recent atypical weather. Now, almost 18 months in, the challenges are still continuing to mount for Monaghan’s IFA chairman, but he has been addressing them head on thus far and, knowing the man, there’s no reason to feel that form won’t continue.